Established in 1982, our company has carved a strong niche for itself in the market, with our experience of almost 30 years in manufacturing. 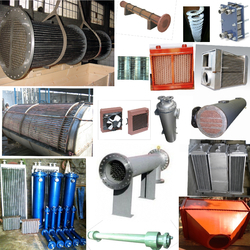 We are one of the leading Manufacturer, Exporter, Trader, Service Provider and Supplier of Shell and Tube Heat Exchangers, Oil Coolers, Plate Heat Exchangers(PHE), Inter-Coolers, After Coolers, Steam Heaters, Air Pre-Heaters, Finned Tube Coolers, Fin Tube Heaters, Cooling Towers, Oil Chillers, Chilling Plants, Condensers, Air Receivers, Air Blast Oil coolers, Hot Air Generators, Industrial Recuperators, Evaporators, Heat Transfer Coils, Submersible Tube Heat Exchangers, Radiators, Jacketed Vessels, Pressure Vessels, Spiral Tension Wound Fin Tubes/ Coolers, Wire Wound Fin Tubes/Coolers, Extruded Finned Tubes, Rectangular/Square Fin Tubes and all Heat Transfer products. Our well established team with in-depth technical understanding, assists the clients in Customizing the products so as to meet their exact requirements. We also undertake Repair and Reconditioning of these Products. These include cleaning, de-sealing, replacement of parts, testing etc. We provide Standby Products to assure no production loss takes place. 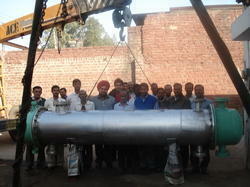 Leakage Testing / Pressure testing are repeated to assure no wastage occurs. 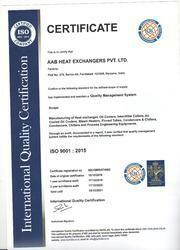 Manufacturing and Trading of Heat Transfer Equipment. Over the past quarter century, the importance of heat exchange has been immensely recognized from the view point of energy conservation, conversion, recovery and successful implementation of new energy sources. Its importance has also increased from standpoint of environmental concerns such as thermal pollution, air pollution, water pollution and waste disposal. 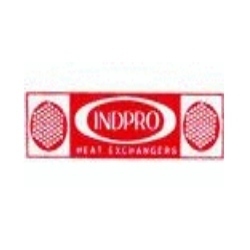 Heat exchange is essential in process, power, transportation, air- conditioning/refrigeration, cryogenic-heat recovery, alternate fuels and manufacturing industries as well in key components of many Industrialproducts available in the market. 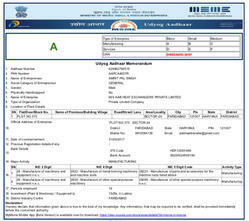 We successfully satisfy our large clientele needs for industrial duty Heat transfer equipment. Our extensive experience and skilled workforce enables us to manufacture a wide range of heat exchange/heat transfer products as per international standards. 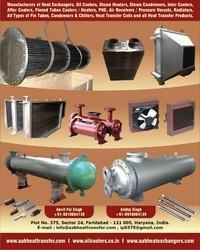 AAB is a quality conscious company which believes in delivering qualitative range of products. 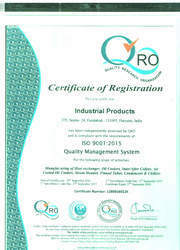 We emphasize on consistency on product quality to provide complete product satisfaction to our clients. 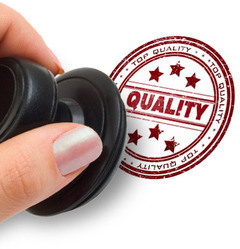 We have a well-laid out quality system to ensure quality at every level starting from the procurement of the raw material to the ultimate delivery of the product. 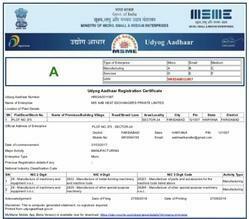 Our products are manufactured in accordance with international repute of quality standards so that the products offered are of highest quality standards. Backed by our efficient workforce, we are capable of providing our clients with a comprehensive range of Heat Transfer Products. All our products are available in various sizes, shapes, designs and models with different specifications at market leading prices to meet the diverse needs of our esteemed clients. We have a team of highly proficient and experienced technicians and workers. Our team is of motivated employees who dedicatedly work towards the meeting of various operations of the company. Their expertise in efficiently handling the various involved processes ensure the flawless production of our range of products. We are divided into separate departments to function effectively & efficiently in the involved operations. Each & every department has its own set of goals, which lead them to work in the direction of delivering qualitative range of products & services with no flaws at any point of operation. Our client centric approach, quality range of equipments, sound strategies and transparent business dealing have helped us in mustering a huge client base across Indian and overseas market. 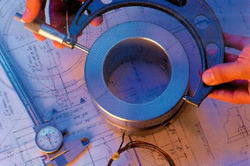 Customization as per requirement of the customer. 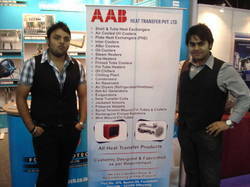 Please Note,"AAB HEAT EXCHANGERS Pvt. 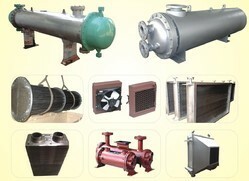 Ltd."was formerly known as "INDUSTRIAL PRODUCTS"
Shell and Tube Type Condensers in Condensing unit.